Eat seasonal foods because they are healthier! We must admit that our ancestors lived in harmony with nature in a much greater extent than we have today. Their diet consisted of foods that they themselves grow and to store. Today, there are all these foods are available throughout the year. Sometimes the local market containing fruits and vegetables that grew in this time of year. For example, you are a fruit that grows in the spring certainly could find during winter or autumn. Today’s supermarkets have a variety of foods at different times of the year. However, this does not mean that their quality at the same time of year. In addition to quality and price varies. Thus, for example, broccoli will be much better and cheaper in February, compared to the summer months. In addition to the consumption of fresh fruit and vegetables great for your health, good for environmental protection must be used because far fewer chemicals to grow food during the season provided for their cultivation. When you eat fruits that are seasonally or when you eat fruits that grow in natural conditions at certain times of the year, you eat them just when they are the healthiest and least harmful to your health. environment – growing food in natural conditions require the use of fewer chemicals that pollute the environment. Clementines contain high levels of salt. A good source of dietary fiber, thiamin, folic acid and potassium. An excellent source of vitamin C.
Clementines are one of the most affordable types of fruit, especially during the winter months. You can use them in the preparation of fruit salads and cakes. If you are tired of clementines eat alone, without any additives, try to make this delicious jam of clementines. It is a rich source of natural sugars, vitamins C, A, E, K and vitamin B. It contains calcium, phosphorus and potassium. It is an excellent source of flavonoids and lycopene. Grapefruit is an excellent preparation for the juices. It goes well with orange juice that reduces the bitterness of grapefruit. In addition to juice, grapefruit can prepare fruit salad, and tea. Try the recipe for hot tea from a grapefruit. It contains a low level of saturated fatty acids, cholesterol and sodium. It’s a good source of folic acid and potassium. It is an excellent source of vitamin C.
Lemon is often used in the preparation of juice. Lemon zest is used to prepare a variety of dishes, both sweet and savory. It is an excellent condiment for salads, enriches the taste of fish and meat, especially chicken. Therefore, try this unusual recipe for chicken in lemon. 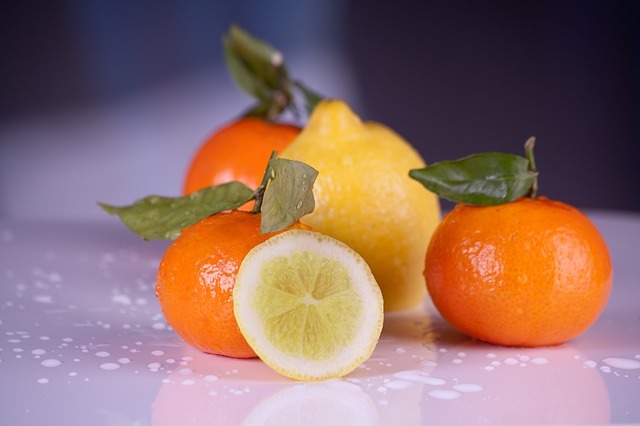 As lemon, orange contain low levels of saturated fatty acids, cholesterol and sodium. It’s a good source of folic acid and potassium. It is an excellent source of vitamin C.
Orange is perfect for cooking juices, fruit salads and desserts. Orange you can prepare salads with vegetables and a variety of sauces that are in excellent agreement with the fish. Try to prepare salmon in orange sauce. Pears contain low levels of saturated fatty acids. A good source of calcium, chlorine, iron, magnesium, sodium and sulfur. Is an excellent source of copper, phosphorus, potassium, vitamins A, B1, B2, C, E and folic acid. Pears are excellent for the preparation of hot and cold dishes. Thus, for example, you can make a cream soup, pear, and a refreshing smoothie. Pears are in excellent agreement with red wine and try to make pears in red wine. This is one of the most affordable food. It grows on almost all lawns. It contains very little saturated fatty acid. It is an excellent source of protein, B vitamins, dietary fiber, vitamin A, C and K. It also abundant in folic acid, calcium, iron, magnesium, phosphorus, potassium and manganese. Arugula, you can prepare in various ways. Most often used as a salad. Arugula can be tasty and healthy topping for pizza. It goes well with pasta and try this healthy lunch of pasta with arugula. It’s low in saturated fat, cholesterol, and salts thereof. They are a great source of calcium, zinc, magnesium and selenium. Also rich in dietary fiber, protein, vitamin A, C, E, K and vitamins B and D complex. They contain iron, potassium and manganese. Asparagus can be prepared in various ways, as a soup, salad, side dish or as a snack for a snack. Rice and asparagus are in excellent agreement and try to make this delicious risotto with asparagus. It contains a low level of saturated fatty acids and cholesterol. It is rich in vitamin C, iron and magnesium. It abounds in dietary fiber, folic acid, potassium and manganese. Beetroot can serve as a salad. You can also prepare soups, supplements, juices or cakes. Try to make this delicious cream soup of beetroot and potatoes. It contains a low level of saturated fatty acids and cholesterol. A good source of protein, vitamin E, thiamin, riboflavin, calcium, iron, magnesium, phosphorus and selenium. It is an excellent source of vitamins A, C, K, B6, folic acid, potassium and manganese. Broccoli, you can prepare in various ways. Make broccoli soup, casserole or pasta with broccoli. Broccoli is a delicious food that is extremely easy to prepare. If you lack ideas, try to make a casserole of chicken and broccoli. Low in saturated fat and cholesterol. It’s a good source of thiamin, riboflavin, iron, magnesium and phosphorus. It is an excellent source of dietary fiber, vitamins A, C, K, B6, folic acid, and potassium and manganese. Broccoli is an unusual taste, a little bitter, which is why most people are not the first top list of your favorite vegetables. However, Brussels sprouts can be tasty if prepared properly. To enjoy the health benefits of broccoli, Brussels sprouts try to do with cranberries. Previous: Lose weight after pregnancy with this plan of exercise!